There is no better place to stay than Elsewhere if you are after a totally relaxing break. Wile away your time swinging in a hammock or rocking in a chair as you watch the eagles soar over the valley. 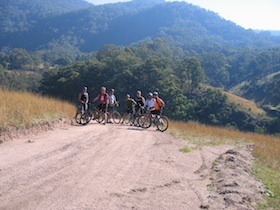 If you want to be energetic, grab one of our mountain bikes and explore Megalong. Alternatively, pack a picnic and wander down to Chaplow creek on the Elsewhere property to sit under the shady tree. There are numerous bushwalks near Elsewhere, including the famous “Six Foot Track”. A short 20 minute drive to Blackheath takes you to other walks and look out spots such as the Grose Valley, Govett’s Leap and Evans Lookout, or there is Mermaid’s Cave and Coachwood Glen from Megalong Road itself. Check the Elsewhere library for other bushwalking ideas ranging from casual strolls through to more challenging walks. 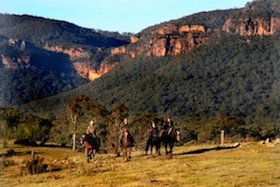 Horse riding is available in the Megalong Valley. Choose from Megalong Valley Farm or Werriberri trail rides – or venture to Centennial Glen stables in the neighbouring Kanimbla Valley. Drive down Megalong Rd to the Famous Six Foot Track and try a spot of wine tasting at Dry Ridge estate or sample some local beef and Olive oil at the Megalong Beef door (Open Sundays only). Blackheath offers a golf course and public swimming pool or watch Keith Rowe glass blower in action producing his marvellous glass works of art. Antiques, art galleries, craft shops and restaurants all abound in the Blue Mountains and are all within 20-30 minute drive from Elsewhere. 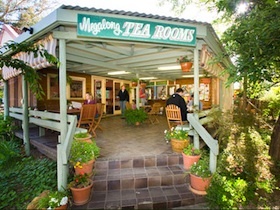 Here are some ideas and useful links for things to do in the Blue Mountains.